Cast: Edward Norton, Jessica Biel, Paul Giamatti, Rufus Sewell, Eddie Marsan. Story: A stage magician loves the Viennese crown prince's fiancee. The Illusionist is the second story in a matter of months to put stage magic in the spotlight - but this is no Prestige, it's far flimsier than that. The Illusionist has been out for ages in the States - and that's never a good sign. When a movie's release is delayed to avoid clashing with another similarly themed film, you know it's because it will suffer in comparison. Where The Prestige constructed its plot meticulously like termites, The Illusionist simply bluffs over the cracks in the hope you won't notice them. 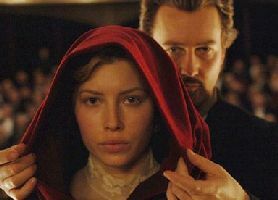 Edward Norton stars as the eponymous prestidigitator, smitten by his childhood sweetheart from a different class (Jessica Biel, from Stealth), who has grown up to become the crown prince's intended. 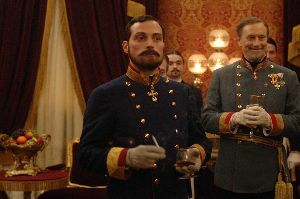 The prince himself, Rufus Sewell (Legend of Zorro), naturally has other ideas and sets tame copper Paul Giamatti (Lady in the Water, Cinderella Man, Sideways) the task of removing him from the equation. What follows is a mixture of gripping intrigue and rather daft plot devices, which works extremely well at some points and falls flat on its nose in others. Set in the Austrian capital Vienna, everyone adopts a subtle and lightly silly accent, which is far more distracting than having no accent at all, because it's only noticeable at certain moments. Edward Norton unwisely underplays the title role, lacking the sensation of inner steel that characterises most stage performers. Jessica Biel is adequate and Paul Giamatti is always a joy, but it's Rufus Sewell who impresses most - he's been perfecting this type of role since he starred alongside Heath Ledger in A Knight's Tale, and he really nails it this time, making much more of a lasting impression than Norton can muster. The cinematography and direction are nicely judged too, with several sequences being genuinely captivating as the story gently leans one way and the other. However, it's the unexpected ending that most disappoints - not for the ultimate path that the story takes, more for the implication it has on the nature of Norton's stage act. Most unsatisfactory. The Illusionist is a compelling drama that makes a good evening's viewing. It stumbles a little on plausibility, but will still engage a forgiving audience. Worth a look - but I'd steer clear of reading other reviews as they tend to give a little too much away. To enjoy this film you should be: generous about the plot details. The Illusionist was released in the UK on 2nd March 2007.